The above picture was taken in a place called Mokola in Ibadan by me, the Village Town Crier in the course of an errand by the King. 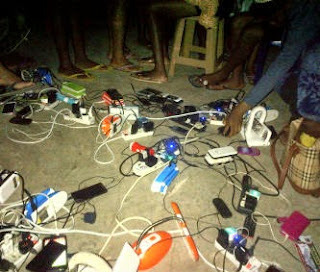 This isn't a photoshopped picture or probably a petty charging centre where individuals pay a token to charge their phones and other power devices for a couple of hours as we have in developing countries. When I came across this, I was forced to come close and take a picture in the spirit of journalism and then do a brief investigation of the pitiful gathering. This is a middle class area in Ibadan that is highly populated with low income earners. Someone in the neighbourhood was financially brave enough to get fuel at an extra ordinary cost for his common Tiger generator (TG 950 class) conventionally referred to as ''I better pass my neighbour'' At the sight of light, men came all across the street to locate him just like the three wisemen in the bible followed the star to locate the position of Jesus Christ from a very far distance. This man decided to play the role of a Good Samaritan; he assumed the unprecedented role of a mini-power company. He became a power station or better still a ''local government" providing light for the people. This is deplorable. This is the high level of poverty and hardship in Nigeria portrayed in one picture. Let it be known that the decisions of political thieves and myopic leaders changed the destiny of this country. The outgoing Nigerian leader, President Goodluck Ebele Jonathan spent over N550 billion on the power project as much as what ex-President Olusegun Obasanjo 'invested' but more darkness was brought to the country rather than light. Power supply in the country currently dropped from 4,000 megawatts to less than 1,300 megawatts in my country in less than a month; in the 21st century. This is happening in an oil rich state, the 6th largest producer of crude oil in the world. I am writing this article with total darkness surrounding me; I have loving mosquitoes romantically flirting with my lonely legs. 18 out of the 23 power plants in Nigeria have shut down. This is an imminent national blackout. I will stop here because the problems are endless. What leaves me in a state of limbo is that the countries we sell oil to have it in abundance while we the producers sleep in filling stations after conquering snake-like queues to get fuel at hyper-inflated prices. All these ills are traceable to mismanagement of funds and poverty of ideas of the path of some leaders flaunting their empty Ph.D degrees with scripted statements to cajole the outside world. I have noticed we can't change our leaders but since the social media has given us a voice in the society, we will never stop exposing the pains and tears of the generality of the masses in Nigeria. That is what I stand for as the modest Village Town Crier to an unknown King. I am Osayimwen Osahon George. The messenger can only be restricted; the message will get to its destination because it is the message of life and truth. Pray for Nigeria! Never lose hope.